I picked a terrible day to sleep in! After sorting through all of the alerts in my inbox this morning, it seems that today's Basara Club fan meetings in Tokyo coincided with the formal announcement of more details for the upcoming anime adaptation! The new series will be broadcast on Nippon TV in 2014 and the animation studio has been switched from Production I.G. to Telecom Animation Film. The first four cast announcements include Date Masamune (Nakai Kazuya), Sanada Yukimura (Hoshi Souichirou), Tokugawa Ieyasu (Ookawa Tooru) and Ishida Mitsunari (Seki Tomokazu), and the story will be based on the Battle of Sekigahara from the Sengoku Basara 3 game. It looks as though there could be be more information on Saturday 22nd March as seiyuu Nakai Kazuya is set to appear at the Anime Japan event during a Nippon TV presentation at 12:20 local time. The Twitter account for the new anime has confirmed that there will be Sengoku Basara: Judge End mugs available for attendees to purchase for ¥1,200. Well, even though I was half expecting today's events to reveal something, I'm so glad we have a piece of artwork already! I'm anxious about the change from Production I.G. (especially after they used them so recently for the cutscenes in Sengoku Basara 4) but things look pretty good at the moment. Hopefully this doesn't mean that they'll completely eschew the SB4 characters, given their designer was on loan from IG. With the exception of Katsuie and Ashikaga, they'd all actually fit in pretty well- and if they go with the whole "Tenkai reviving Nobunaga" thing again they could very well show Ashikaga in flashbacks and revive Katsuie outright- he was revived alongside Nobunaga at the Honnoji stage in SB3 after all. Sorin and Muneshige should show up too! It's also a bit early to say such a thing, but I hope that Funimation will bring it over too, even if Capcom USA doesn't care about the series any longer. I'm hoping that having Masamune and Yukimura topping the list of character announcements means they're hoping to connect with the fans from the previous anime adaptations, which should mean that the rest of the old cast will be appearing too even if the Sekigahara confrontation is the main stage. However, if they use this as a reason to leave Oyakata-sama lying sick in bed for the entire show I'll be pretty sad. I know that a lot of Sengoku Basara 3 fans felt very shortchanged by seeing most of the new cast skipped in The Last Party so I hope they can somehow fit everyone in properly. My preferred - and possibly unrealistic - solution for this is for it to be an ongoing show which runs for years, but I'll accept an episodic format where each army gets a chance to be the main focus for a while as an alternative instead of giving them all one line per episode while the leads run around doing their thing. The eventual US release is a little awkward for me as I'd definitely like Funimation to grab it and do another excellent (and matching) BD/DVD combo set for the fans, but if they pick it up it's really unlikely that there will be any way to watch a simulcast from the UK in a way which lets me support the show. If they do, I really hope there'll be a UK-friendly stream too somewhere. I guess this is really on, then. Is it just me or do the characters look a bit different? Or maybe it's just that they look all frowny (save Ieyasu). I really hope they'll keep the main creative staff even though they changed animation studios... Also, I really really hope that they'll get Sawano Hiroyuki to do the music again. His score for the previous anime was awesome, and it was so absolutely perfect for the characters as well as the setting, that I'd be very disappointed and a lot less excited about the anime if someone else did the music this time. I think that the designs are intended to be based on the original anime artwork for the sake of familiarity but yeah, there do seem to be some differences (and has Yukimura lost his 'forked' eyebrow?). I don't dislike the new artwork so far, so I'm staying cautiously optimistic about what the staff have planned. 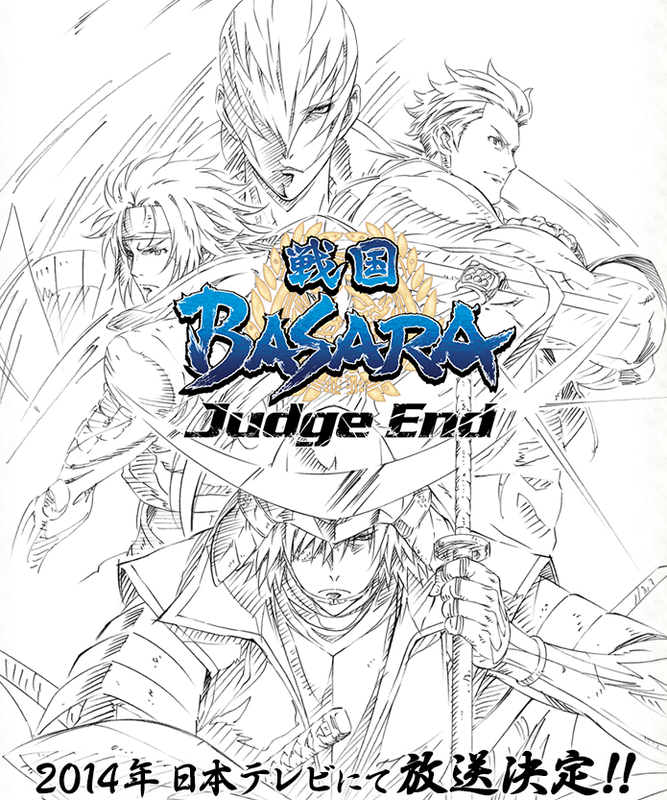 It would be nice if they could use Judge End to tell the story of 3 in a way which left things open to continue adapting stories from Sengoku Basara 4 with the expanded cast, without needing too many confusing retcons about the Toyotomi timeline. Fans who don't keep up with the multiple retellings seem baffled by all of the contradictions between the games and anime already (let alone the contradictions between the anime and itself ^^;). Definitely agree about Sawano. He did a fantastic job. I hope Yukimura’s eyebrows will be safe (lol) and also that Sawano will return as a composer. His OST’s for this series were just great, perfect composer for Attack on Titan too.